I was first struck by the “feel” of this fibre – an amazingly soft and lustrous fibre of 50% camel and 50% silk, purchased from West Coast Colour and Carding at Fibres West. Lynne has a fabulous way of dyeing that produces so much more than “What you see is what you get”. What you see on the surface of the roving are deep, intense colours – in this case, reds, greens, blues, pearls, pinks, purples, and an occasional flash of orange. 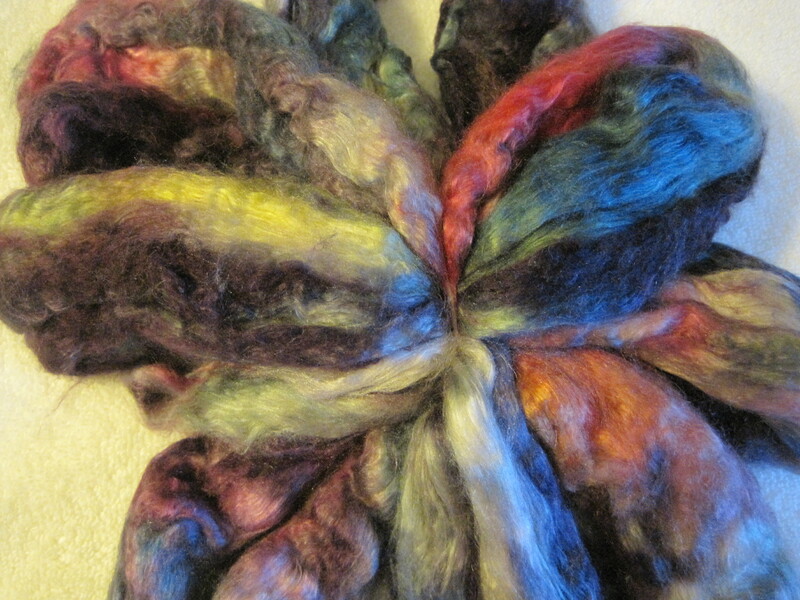 What I get through spinning are incredible variations on a theme and colours that do not repeat but instead change across and up and down the roving. For me this fibre was “love at first sight.” As I spun it made me think about a tumultuous, tumbling ride along the rapids, reaching slow, calm, waters, and then pulled into the rapids again. I just kept spinning, eager to see where it would take me, just like being caught in the rush of a new love. 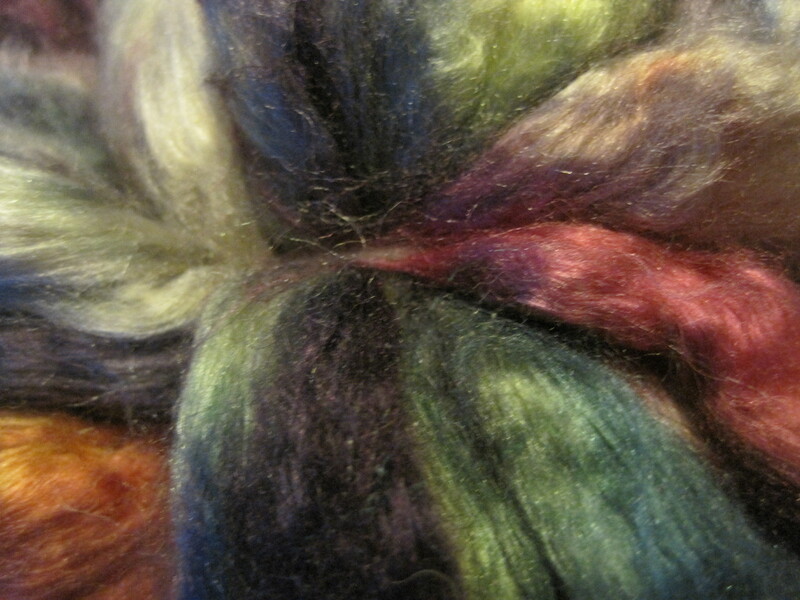 I decided to spin this fibre fine, emphasizing the luster of the silk, intending to use it for weaving. I got a beautiful random variegated yarn, and made a 2-ply yarn. 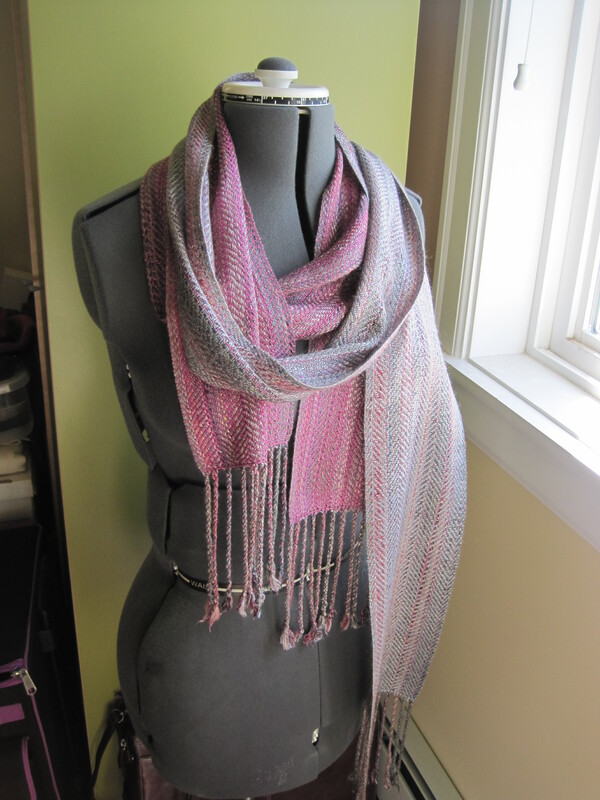 I used a short forward worsted draft for stability while weaving. The fibres drafted easily creating a slippery, high luster yarn. 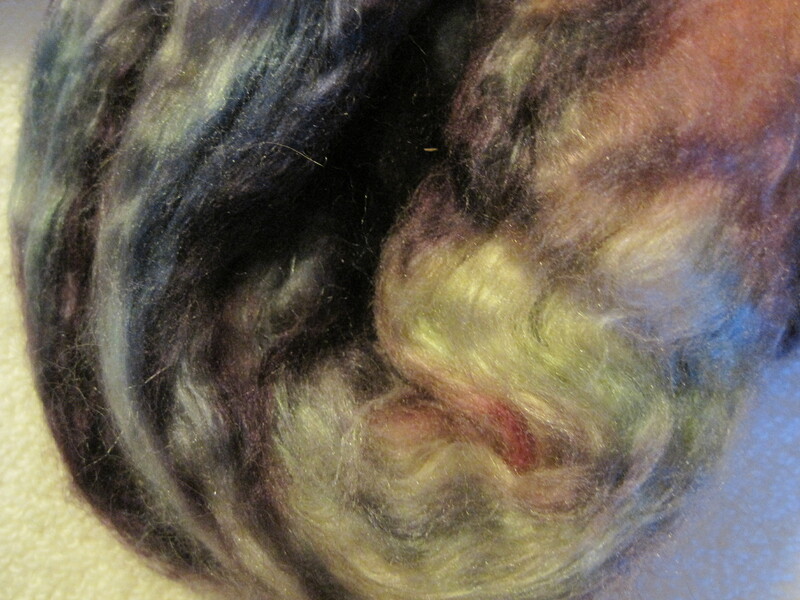 I continued spinning, moving through colours from fuchsia lipstick to stormy grays. It was so interesting to spin because the colours were constantly changing. The resulting yarn is lace-weight, and I ended up with 493 yards of 2-ply from 113 gms (4 oz) of fibre. 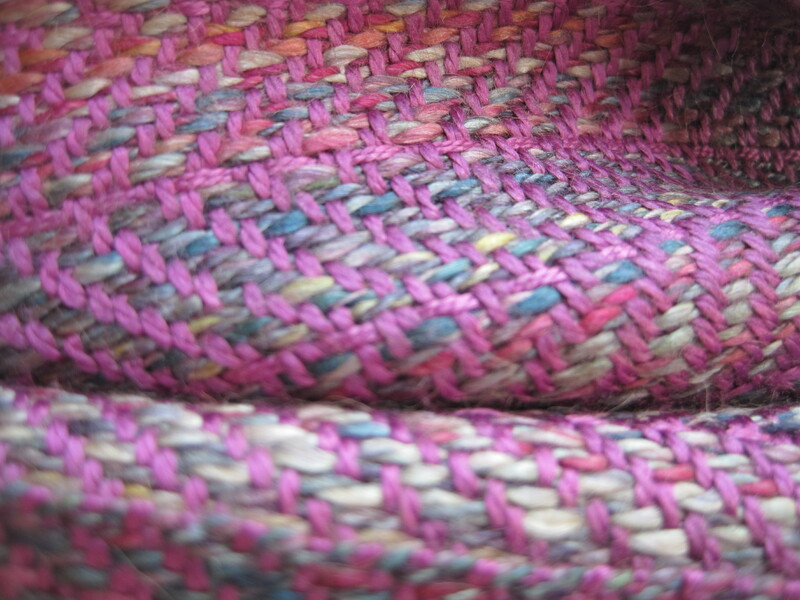 Woven on my four shaft loom, I selected a broken herringbone twill. I tried to insert a copy of the draft here, but it is in Excel, and will not copy to this format. I need to research hows to make this work. 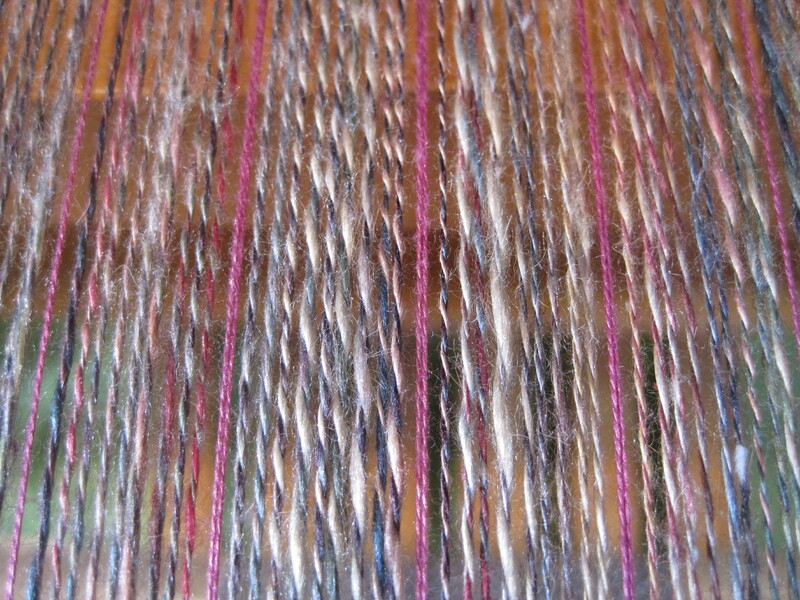 For weft I chose 2/20 silk in pale blue-gray for the first scarf and fuchsia for the second scarf . Both were woven at 15 picks per inch for a length of 72 inches on the loom, excluding fringes. The ends were twisted and then the scarves were finished with a hand wash in a warm bath with mild agitation to full the yarns, laid flat to dry and ironed while slightly damp with a warm iron set to silk. 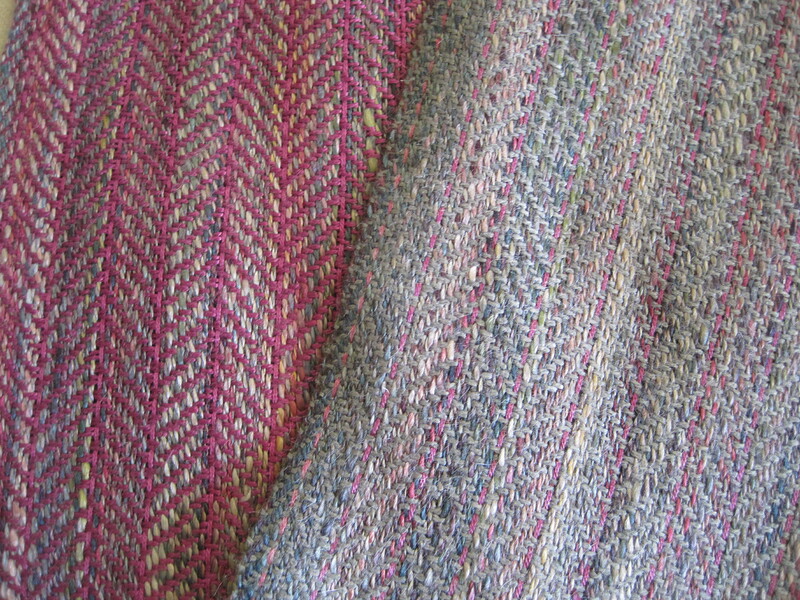 Two finished scarves, soft to the skin, with good drape and a pleasure to make from start to finish. 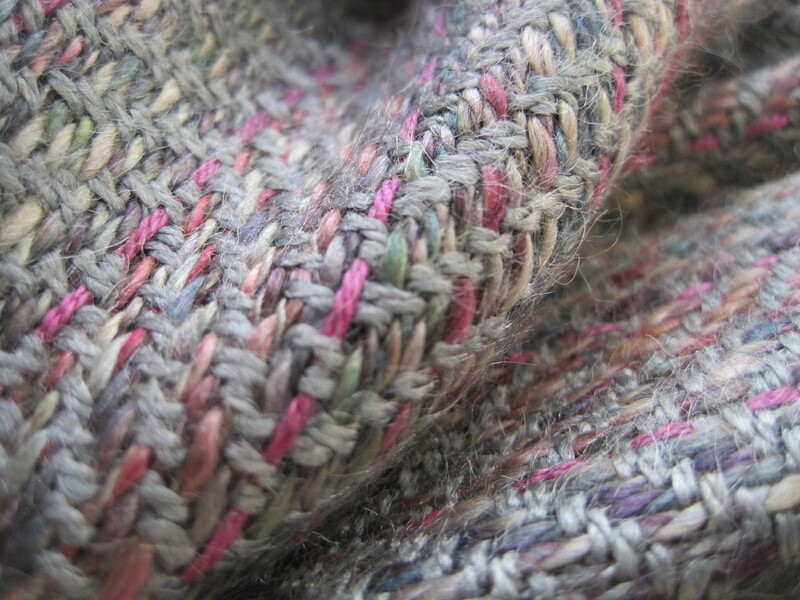 This entry was posted in Spinning, Weaving and tagged camel, colour, Crackle Weave, Fibres West 2015, hand weaving, handspun, handwoven, Loom, Roving, Scarf, scarves, Silk, Spinning, Warp, Weft, West Coast Colour and Carding. Bookmark the permalink. What a feeling of satisfaction this must give you! They are simply gorgeous and ALL yours!